Step 1. Toast the bread. Step 2. 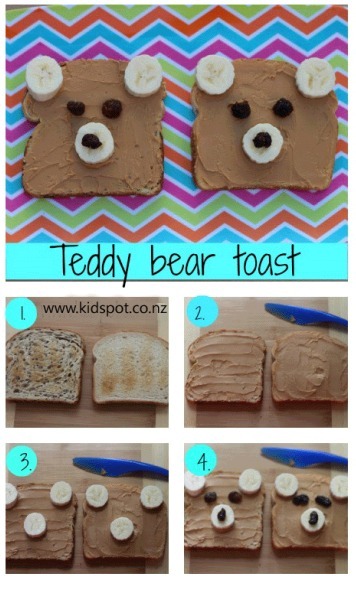 Spread with peanut butter. Step 3. Add banana slices for the ears and nose. Step 4. Place the raisins on each slice for the eyes and in the centre of the banana nose. These teddy bears are made with peanut butter, but you can find nut-free alternatives in the supermarket. If nuts aren't an issue, then you can also use Nutella in place of the peanut butter.